Engineers from 937th Clearance Company prepare to place concertina wire on the Arizona-Mexico border wall, Dec. 1, 2018. Money to extend border barriers and lavish use of the war fund are already drawing bipartisan fire. The Pentagon is asking Congress to approve a $750 billion budget for fiscal 2020 under a spending plan that is already facing criticism from Democrats and Republicans. Trump administration officials said Monday that the defense budget request “enhances the military’s readiness and lethality, prioritizing strategic competition with China and Russia,” a key tenet of its year-old National Defense Strategy. 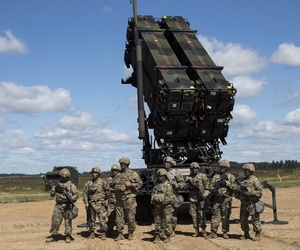 The Pentagon-specific portion of the request totals $718 billion, which is $33 billion (5 percent) higher than what Congress approved for the military in 2019. The administration sent the entire federal spending request to lawmakers on Monday, but declined to make it available to the media or the broader public. Top Pentagon and military service officials are scheduled to brief the press on Tuesday. In addition to that, the Pentagon is planning to release more detailed budget justification documents next week. Related: Would a $700 Billion Budget Really Sink the Pentagon? The massive OCO request is sure to get blowback from Democrats and Republicans alike. Historically, the OCO budget has been used to fund war operations. However, the Trump administration has chosen to use that account, which lawmakers have long called a slush fund, as a way to circumvent federal spending caps that run through 2021. 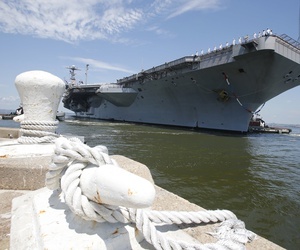 “The oversized OCO request is troubling, however, because it takes a short-sighted view of the military rebuild,” Fred Bartels, a defense budget analyst at the conservative Heritage Foundation, said in an emailed statement on Monday. Funding for Trump’s much-desired wall on the border with Mexico could draw scrutiny on Capitol Hill. Mackenzie Eaglen and Rick Berger, analysts at the conservative American Enterprise Institute who have argued for a higher-than-$750 billion defense budget, said the administration’s request “inappropriately included border wall funding” alongside military spending. “That’s basically just growth with inflation from 2019, and it continues a flat defense spending trajectory for years to come,” Eaglen and Berger wrote. The budget request includes an unspecified amount of funding for creating the U.S. Space Force, a new branch of the military. 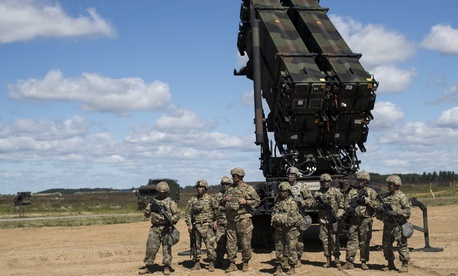 There is also funding for standing up U.S. Space Command, a new combatant command for space warfighting, and the Space Development Agency, a new organization that will oversee satellite buying. $286 million “to ensure a robust, resilient, secure, and ready manufacturing and defense industrial base.” Specifics are not included. Also of note, the document states that the Pentagon saved $4.7 billion by making business practice reforms in fiscals 2017 and 2018. Another $6 billion is being targeted in fiscal 2019. “The objective is not simply savings over time, but a sustainable change in process and culture that will continue to ensure the most effective use of resources and increased lethality,” the document states. The defense budget request makes up 3.2 percent of of the U.S. gross domestic product, or GDP, according to the Trump administration. 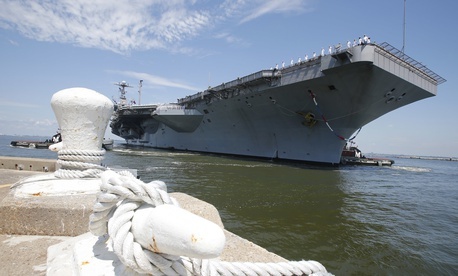 Does USS Truman’s Early Retirement Herald a New War on Carriers?